Sao Paulo FC won their last 7 games in Serie A (Brazil). Palmeiras allowed opponents to score over 1.5 goals in last 4 away games in Serie A (Brazil). Sao Paulo FC has over 2.5 goals in their last 3 home games in Serie A (Brazil). Sao Paulo FC won their last 8 home games in Serie A (Brazil). Beijing Guoan has over 2.5 goals in their last 11 games in Super League (China). Shandong Luneng scored in last 4 games in Super League (China). Shanghai SIPG scored in last 8 away games in Super League (China). Dalian Aerbing scored in last 3 games in Super League (China). Shanghai SIPG scored in last 18 games in Super League (China). Beijing Guoan has over 2.5 goals in their last 6 home games in Super League (China). Beijing Guoan won their last 3 home games in Super League (China). Beijing Guoan scored in last 6 home games in Super League (China). Odense has over 2.5 goals in their last 3 home games in Superligaen. Copenhagen has over 2.5 goals in their last 3 games in Superligaen. Brondby scored in last 31 games in Superligaen. Nordsjalland scored in last 11 games in Superligaen. Copenhagen won their last 3 away games in Superligaen. Brondby allowed opponents to score over 1.5 goals in last 5 home games in Superligaen. Copenhagen won their last 3 games in Superligaen. Copenhagen scored in last 3 away games in Superligaen. Brondby scored in last 14 home games in Superligaen. Nordsjalland scored in last 5 away games in Superligaen. 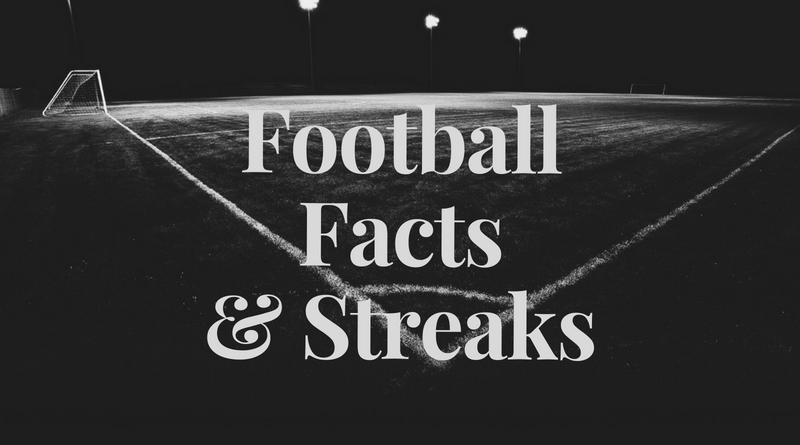 Leeds United allowed opponents to score over 1.5 goals in last 3 home games Championship. Stoke City has under 2.5 goals in their last 3 games. Ilves has under 2.5 goals in their last 5 home games in Veikkausliiga. Ilves scored in last 3 games in Veikkausliiga. Honka scored in last 15 away games in Veikkausliiga. Honka scored in last 3 games in Veikkausliiga. Ilves allowed opponents to score over 1.5 goals in last 5 home games in Veikkausliiga. Darmstadt 98 scored in last 10 games in II Bundesliga. St. Pauli scored in last 4 games in II Bundesliga. Darmstadt 98 scored in last 8 home games in II Bundesliga. St. Pauli scored in last 3 away games in II Bundesliga. Darmstadt 98 won their last 3 games in II Bundesliga. Gamba Osaka has over 2.5 goals in their last 5 away games in J League (Japan). Vissel scored in last 13 away games in J League (Japan). Sagan Tosu has under 2.5 goals in their last 3 games in J League (Japan). Jubilo ended draw their last 3 games in J League (Japan). Vegalta scored in last 9 games in J League (Japan). Sagan Tosu allowed opponents to score over 1.5 goals in last 4 home games in J League (Japan). Sagan Tosu allowed opponents to score over 1.5 goals in last 5 games in J League (Japan). Jubilo has over 2.5 goals in their last 4 home games in J League (Japan). Jubilo scored in last 5 home games in J League (Japan). Vegalta scored in last 3 away games in J League (Japan). Valerenga has over 2.5 goals in their last 4 home games in Eliteserien. Valerenga scored over 1.5 goals in last 4 home games in Eliteserien. Sarpsborg 08 won their last 3 games in Eliteserien. Sarpsborg 08 scored in last 14 games in Eliteserien. Sarpsborg 08 scored in last 9 away games in Eliteserien. Sandefjord scored in last 4 away games in Eliteserien. Valerenga scored in last 5 home games in Eliteserien. Rangers has under 2.5 goals in their last 3 games in Premiership. Aberdeen has under 2.5 goals in their last 3 home games in Premiership. Rangers scored in last 3 games in Premiership. Aberdeen scored in last 9 games in Premiership. Aberdeen scored in last 6 home games in Premiership. Sporting Kansas City lost their last 3 games in MLS. Colorado Rapids has over 2.5 goals in their last 3 games in MLS. LA Galaxy has over 2.5 goals in their last 8 games in MLS. Philadelphia Union has over 2.5 goals in their last 4 away games in MLS. Portland Timbers has over 2.5 goals in their last 3 games in MLS. Colorado Rapids scored in last 3 games in MLS. Sporting Kansas City has over 2.5 goals in their last 3 away games in MLS. Portland Timbers has over 2.5 goals in their last 3 home games in MLS. Portland Timbers scored in last 3 games in MLS. LA Galaxy scored in last 5 away games in MLS. Portland Timbers scored in last 4 home games in MLS. Sporting Kansas City has over 2.5 goals in their last 5 games in MLS. Sporting Kansas City lost their last 4 away games in MLS. Houston Dynamo scored in last 9 home games in MLS.